For Tor Hagen (above), it was a dream come true – the first ship in the Viking Oceans Cruise Line, christened in his spiritual home of Bergen on Norwegian Constitution Day. A real hat-trick of celebrations. No wonder he has a smile as wide as the North Sea. 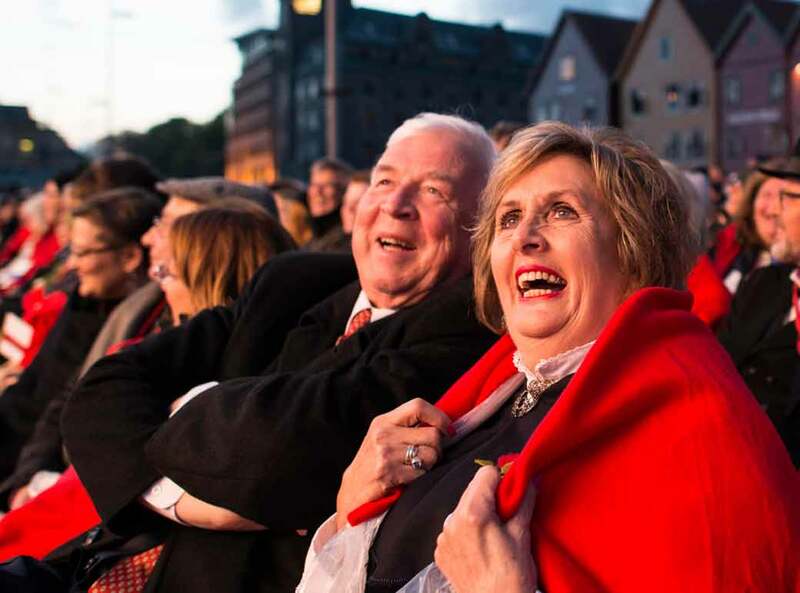 The christening ceremony took place on Sunday evening, performed by the mayor of Bergen in front of 20,000 local residents and invited guests. It is the first time in 10 years that a Norwegian-flagged cruise ship has been registered in Norway’s second city. The ceremony was the culmination of a maiden voyage that began on 11 April when the ship left Istanbul. Over the last five weeks, she made stops in what will be regular ports of call in the Mediterranean and Western Europe, including Athens, Santorini, Kotor, Dubrovnik, Venice, Barcelona, Cadiz, Gibraltar, Lisbon, Paris, and London. Yesterday in Bergen, Viking Star was positioned in the harbour to serve as the backdrop for a first-of-its kind floating concert. As thousands gathered along the waterfront, they were treated to performances by world-renowned artists and musicians – all of whom have a personal connection to Bergen – including Norwegian soprano Sissel, actor Bjarte Hjelmeland, singer-songwriter Sondre Lerche, acclaimed violinist Charlie Siem and comedy duo Ylvis. Following the concert, christening ceremony, and a fireworks display, Viking Star embarkd on a special journey to Oslo; from there she will continue to Copenhagen, Berlin, St. Petersburg, Tallinn, Helsinki and Stockholm. Viking Star, which carries 930 passengers in 465 all-veranda cabins, has already been widely praised for its clean design – epitomised in the blonde wood “trees” stretching up to the ceiling of the Winter Garden, and the light, airy expanses of its forward-looking double-height Explorer’s Lounge. Floor to ceiling windows in its restaurants open out onto the deck to allow al fresco dining, and the ship has the first true infinity pool at sea. Get the next issue of World of Cruising for a review of Viking Star by editor John Honeywell, who sailed on the ship earlier this month.